Escape bustling Shanghai in favor of tranquil Zhujiajiao on a private full-day tour, ideal for first-time visitors seeking a personalized experience. 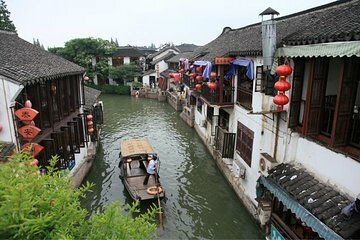 Departing from Shanghai, you’ll spend the day exploring Zhujiajiao’s 1,700-year-old canal network by foot and during a boat cruise. Tick off some of the town’s 36 bridges and stroll around Zhi Yuan and Course Plant gardens. Hotel pickup and drop-off are included. Our guide was Zak and he was excellent. We made a change to the itinerary, and he had many options for us. The driver was professional and safe. We enjoyed it very much, and recommend it.